Travel Fashion or Travel Gear? I admit upfront that the topic of travel fashion/clothing makes me nervous. Those who know me will vouch for the fact that I can pack for even an overseas business trip in an hour or so. I will pack two business suits, formal shoes, a few shirts and I am done. Other than that I love it if it is a cold place. That means I only have to worry about my jeans and the down jacket looking respectable, rest of the stuff doesn’t matter! My sister (who dresses up well) kept buying fancy tops before my UK trips and I would always tell her, “It is going to be so cold that I am always going to wear a jacket or coat! So don’t bother.” I am that kind of traveler. Unlike my sister I don’t spend hours in markets or shopping mall to find the dresses for my trip when I can buy the best of them online through various online portals at the lower price. On holiday trips I am even worse, my packing would entirely consist of jeans and shirts and if it is a sponsored trip maybe one or two dresses that can be won for formal lunch and dinner. On such trips I only worry with sneakers as they are comfortable for walking and one other footwear that will go with more formal dresses. Shoes can make or Break a Trek! But let the talk turn to trekking gear and I may have a tip or two to share! The fewer clothes you carry the easier it is on the person who is carrying your rucksack. If you are carrying it yourself this is self evident! Getting wet or cold on treks is no fun. It is very important to have gear for rainy days and that will keep you warm. It means good rain coats, down jackets, fleece, layers and other such sensible stuff. If I have to choose between cosmetics and camera gear it will always be more camera gear. I am fine with a bottle of moisturizer and soap. 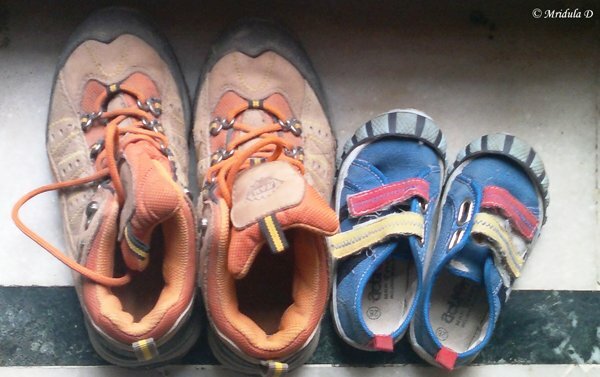 Trekking shoes can make or break your trek. I learned it the hard way by trekking in a sneaker on my first trek. There were two of us on that YHAI trek and the young man told me, “What a pity, where everyone else can walk you and I end up on all fours.” We slipped and slipped on that trek. Having a clean pair of clothes at the end of the trek can do wonders to the mood. After the trek is over trappings of civilization become important again!